Something that a lot of people have troubles with is knowing what to do or say when accepting gifts. 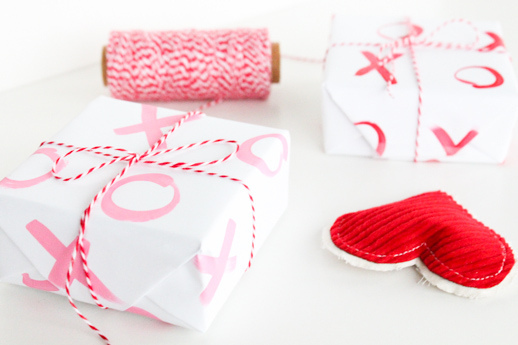 Valentine’s Day is tomorrow, and people tend to give each other gifts that day. But something we often get lost with doing is how to react when getting that gift or even what to say. There are many reactions one can give when getting a gift, the reaction can be a nice reaction or may come off as rude. My purpose of writing this post is to give some ideas or reminders on how to react when getting a gift. Something that you should not do when getting a gift is taking the gift too lightly, you don’t want to sound like you don’t care, even if you really don’t. For example, don’t say just say thank you and leave it at that. Also don’t over react about it when you get it, you don’t want to look desperate for a gift. You don’t want to be like “O my gosh! It’s a gift! I can’t believe it! Thank you so much!” This might also annoy the person that is giving you the gift a bit. What you want to say is “I appreciate it so much, thank you. I love the gift” and try keeping a bright smile on your face. Also, no matter how much they spent on the gift, it is always good to send a thank you note. The Thank You note shows how much you appreciate the gift and makes the other person feel good knowing that you liked the gift. I gave a gift to my bus driver before Christmas break and he gave me a thank you card as soon as I walked on after break. Nice manners! When I got it I knew he appreciated the gift and it made me happy that he liked it. Gifts are something that a person doesn’t have to do for you but they still do because they like you enough as a person. You never know what extent the person getting the gift might go to. For example, say your friend wanted to get you a gift for Valentine’s Day, they might be nagging their parents to give them a ride to the store and having to buy the gift with their own money. When you put yourself in their shoes then you will learn how to accept the gift in a nicer way, even if it is candy. Speaking of gifts, I wanted to share what I did for my friends last year. It’s been harder to come up with gifts for my friends because I can no longer get those small cards that come with free lollipops. 🙂 Last year I found these body sprays at Ross and I thought to myself: what girl doesn’t want to smell nice? I made sure to ask my friends if they were allergic to anything before I gave it to them. My sister decided to get her friends lotion because we found them along with the body sprays. 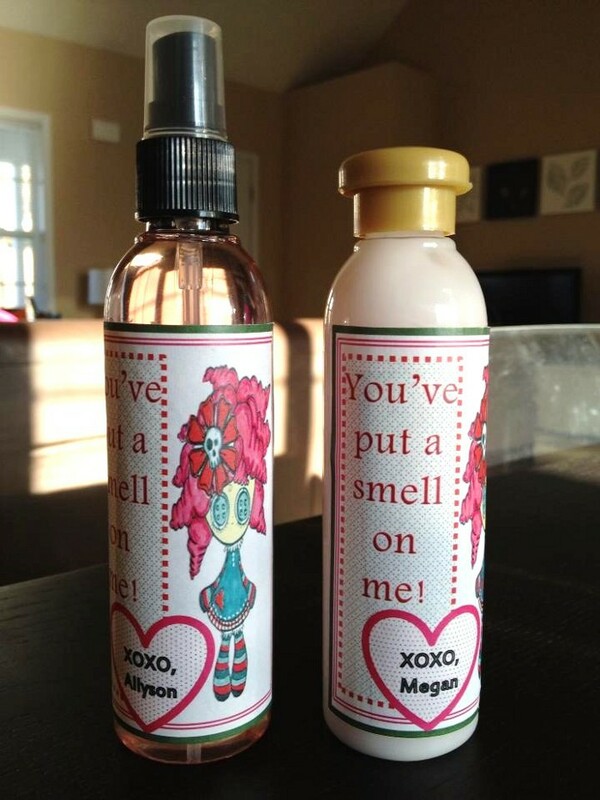 We took of the labels on the bottles and made our own labels with an image we got off the internet. The label said “You’ve put a smell on me” and it had a picture of a voodoo doll next to it. 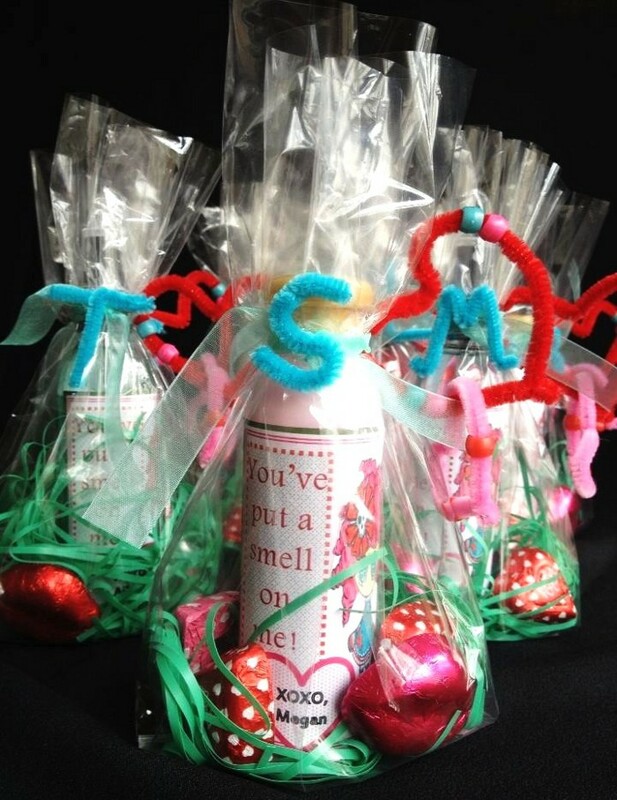 Then we put the bottles in a baggie along with some chocolates. I give props to my mom for coming up with ideas and helping me out with the gifts. My friends loved the gifts and they thought that the wrapping was absolutely adorable.